Lil GTM is a powerful mini moving spot head, packed with many of the same high quality features found in larger professional moving head fixtures. Lil GTM has a 40-watt LED light source with 9° optics that produces beautiful beams with 9 gobo patterns + open, 7 colors + white, bi-directional color/gobo rotation, rainbow flow effects and gobo shake. Then, its precise 540° pan and 220° tilt make it a super aerial performer in a tiny, lightweight package. Controlling Lil’ GTM is a breeze using just 11-channels of DMX, or by using its 4-button LCD control panel, which both offer complete control of every available feature including pan/tilt with fine 16-bit adjustments & speed control, ultra- smooth 16-bit dimming, strobe (1Hz-10Hz), bi-directional color wheel, bi- directional gobo wheel, auto mode, sound active mode, and fixture reset. 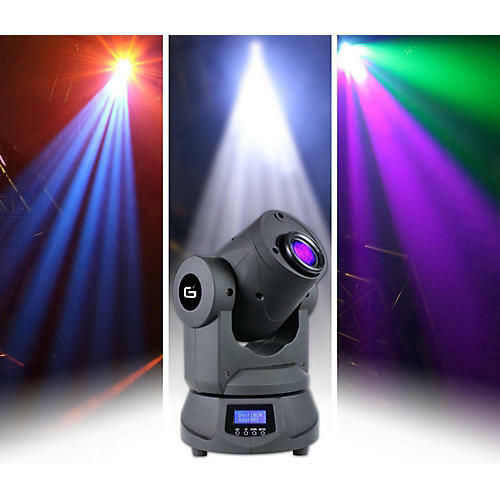 The power input connection found on the back side of Lil GTM is industry standard PowerCON® compatible, and DMX 3-pin In/Out jacks + a single clamp mounting bracket round out the many professional features you’ll find in this intensively engineered, incredible mini moving head effect fixture.